Trademarkia … How Do You Justify That? | Trademarkia … How Do You Justify That? Most laypersons with a rudimentary understanding of business and commerce know that NIKE SHOES, MCDONALDS BURGERS and STARBUKS are not available trademarks and filing a USPTO trademark application would be a waste of money. But these are the obvious examples. The real problem is most trademark searches are done for legitimate purposes for terms and words that are not always so obviously unavailable. 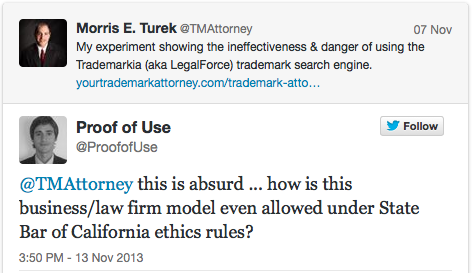 Trademarkia has a twisted and faulty view of pre-filing trademark clearance. Its results are black and white and trademark law is all gray. The standard for reviewing marks is whether they are “confusingly similar” not identical. There are subtleties and subjectivity and meanings and impressions … all of the stuff that fits into the gray area but not Trademarkia’s search algorithm. How could Trademarkia steer its users into spending money on a fatal trademark application? This is simply not possible — and never will be — when Trademarkia users are directed to apply for trademarks that (1) are obviously not available for registration, (2) waste money and resources, and (3) subject them to lawsuits and claims of trademark infringement. A few hours later “LF Trademarkia” (@Trademarkia) started “Following Me” on Twitter. And a few days after that I was informed by a client that it received an unsolicited email from “Trademarkia.com” regarding its approaching deadline to respond to a USPTO office action. My client was so confused by the wording in the “Trademarkia.com” correspondence that it thought the email was from the USPTO. Apparently others have been similarly confused. ME: It is highly unethical for you to be sending correspondence to my clients. I am the listed attorney of record. Do not do this again. ME: My client never subscribed or “opted in” to your service. How do you justify that? Trademarkia: We are a private company that assists applicants in their business with the United States Patent and Trademark Office (USPTO). To make this easier, we send out helpful reminders to all applicants who have filed with the USPTO (by way of communication with their listed Correspondent), regardless of whether we’ve worked with them directly. ME: You are a law firm and you are having direct contact with my client who is listed as having an attorney of record with the USPTO. How do you justify that? 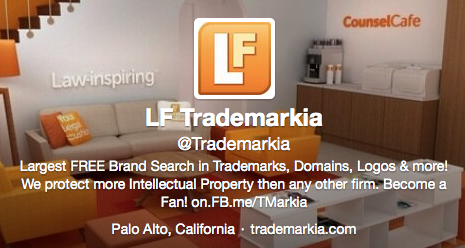 Trademarkia: We are not a law firm, Legal Force Trademarkia assists with the trademark application process. We have an affiliate law firm that only our clients deal with. ME: What’s the name of the “affiliate law firm”? They never responded to my last email. But they did immediately “unfollow” me on Twitter. Now, if a basic tenet of trademark law is that marks function as source indicators and if both LEGAL FORCE TRADEMARKIA and LEGAL FORCE RAPC WORLDWIDE use the same marks, names and logos then surely they must point to the same source. Unless Trademarkia says they don’t. It’s ironic that both companies – who are in the business of avoiding consumer confusion – create so much … well, confusion. Wait a minute … I don’t understand … where did Legal Force RAPC Worldwide P.C. go? And where did Raj Abhyanker P.C. come from? Raj Abhyanker is the co-founder and CEO of Legal Force Trademarkia and founding partner of Raj Abhyanker P.C. and Legal Force RAPC Worldwide. He is a self-described “patent attorney” (…but lets not go there) and ultimately the man behind the Trademarkia curtain. His law firm Raj Abhyanker P.C. has an “exclusive” referral “advertising” agreement with Trademarkia.com in the United States. Sweet deal! Here’s the link to Legal Force Trademarkia “advertisers”. Notice when you click on Raj Abhyanker P.C.‘s web address <www.rajpatent.com> you are re-directed to the Legal Force RAPC Worldwide website. Why do they do that? And I find no mention of Raj Abhyanker P.C. on the Legal Force RAPC Worldwide website. What does seem clear to me is that Trademarkia — in all its names and forms — functions as an exclusive referral funnel for Raj Abhyanker’s legal services — in all its names and forms. The answer … I don’t know. They’ve been around long enough that one would think this would have been sorted out by now. Anyway, who am I to question Trademarkia’s legal ethics when Raj Abhyanker himself has given a presentation on “Legal Ethics in the Age of the Internet” at Stanford Law School. applicants listed as having an “attorney of record” are off-limits. I’m not asking for professional responsibility just a little professional courtesy. It’s not as if Legal Force RAPC Worldwide P.C. needs to poach my clients or anyone’s clients. In the following video clip from a different Stanford Law School presentation Raj explains that his legal business is on pace to have collectively filed more than 21,000 trademark applications … more than “any other law firm in the history of the United States” (see @ around 3:10). He adds: “we’re adding 700-900 clients a month to our law firm that backs this business” (see @ around 3:30). She had no idea … and that was after his presentation had ended. … and that I, not Raj, should “Apply Now” to register the trademarks. But I wouldn’t do that – I know better.